January 1, 2018 at 9:19 am. In 1998, Clay Scroggins moved to Atlanta to study engineering at college. 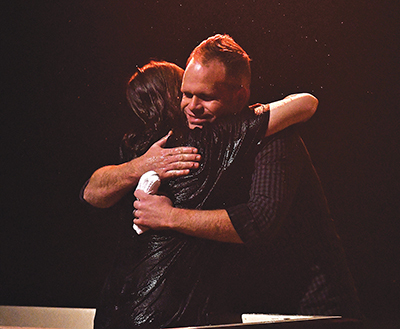 He found a church home in North Point Community Church in Alpharetta, led by Senior Pastor Andy Stanley — first as an attendee, and then as a volunteer in the high school ministry. When graduation arrived, Scroggins had a big decision to make. For him, the path forward looked very different than the one he’d pursued, professionally, up to that point: he would go to seminary. 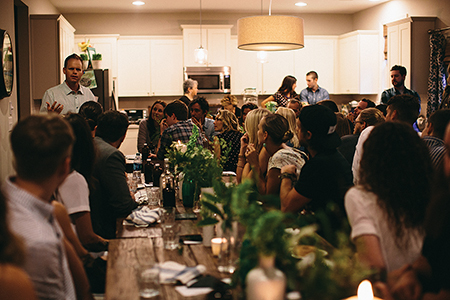 After graduating from Dallas Seminary, Scroggins returned to Atlanta to do what he wanted most: join the staff at North Point. For five years, he served as a high school director at one of the church’s campuses. After that, he took on the role of campus pastor. “We call them ‘lead pastors’ now, because most people outside of the church world hear ‘campus’ and think we’re some kind of school,” he laughs. 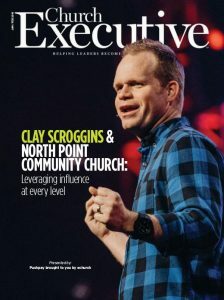 Then, about three years ago, Senior Pastor Andy Stanley — not feeling well — called Scroggins the night before a monthly all-staff leadership-teaching meeting, asking him to fill in. “He said, ‘Hey, somebody mentioned you have something you could do,’” Scroggins recalls, referring to some thoughts on leadership he’d recently put together, somewhat informally. He taught them at the meeting. It was so well-received that Stanley asked him to participate in his leadership podcast — which, of course, has a great reach — and soon, Scroggins was receiving quite a bit of interest in his teaching. It didn’t just come from other churches; businesses, nonprofits and schools were also paying attention. “I starting thinking, Gosh, well, if this can help them, maybe there’s a larger audience for this,” Scroggins recalls. Today, you can find his book, How to Lead When You’re Not in Charge: Leveraging Influence When You Lack Authority, on Zondervan’s website. It’s also available on Amazon.com. The book has been spotlighted in Influence and RELEVANT magazines. It was also featured in Harvard Business Review. A key message is resonating across this wide platform: Great leaders don’t wait for authority. Later this month, Scroggins will deliver a keynote session, “How to Lead When you Are Not in Charge,” at Summit, a three-day, interactive conference in Anaheim focused on connecting leading growth and engagement experts of fast-growing churches with pastors, church leaders, and church staff. He joins Erwin Raphael McManus, author and pastor of MOSAIC; Claire Diaz-Ortiz, author speaker and Technology Innovator; and Scott Harrison, founder and CEO of charity: water. We were fortunate to catch up with him to talk about understanding one’s identify as a leader, four behaviors to cultivate to hone influence, and more — all of them crucial, no matter where you fall on the organizational chart. Why does the leadership of people who aren’t in charge matter? First and foremost, it matters for the person; I didn’t write the book for the organization (even though the organization definitely gets better, too). It’s really just my story of thinking, If only I had more authority, I would be able to lead more. I would get a promotion and more responsibility. I’d have a higher level on the organizational chart. But, all that wouldn’t necessarily allow me to ‘lead’ more. A lot of people feel stuck in organizations. A lot of people feel victim to the organizational structure. A lot of people feel like they’ve got more to offer under the hood. But, because of their position, they feel like they can’t lead yet. Instead, there’s an opportunity to unlock the influence every one of us can cultivate, and to leverage the organization to help our ideas, not feel like a barrier. How is the influence you describe in your book different from positional authority? It’s a better way of leadership. I tell a story in the book about the first time I really saw this in action. I was 21, interning at the state capitol. A new governor was in office. My desk was positioned right next to the conference room where he and his team made big decisions. At that point, I’d never been to a leadership conference. I’d never read a leadership book. I couldn’t have defined “leadership.” But, I remember thinking, Uh-oh … something’s broken. He was using his positional authority to get people to move. That works, but it also makes them update their LinkedIn profiles, because no one likes to work in that environment. And actually, I think our culture is increasingly demanding that leaders lead through influence, not through positional authority. Authenticity really breeds influence. When a leader says, “Hey, I know this doesn’t make sense to you, and you might not see the bigger picture, but this is the way we’re going to do it right now” — that’s so much better than somebody trying to sell me on something that they don’t even believe themselves. In your book, you write about the importance of understanding your identity as a leader. What tools have you used to help you better understand your own identity as a leader? The greatest thing anyone can do to understand their identity as a leader is to be honest about their past and their emotions. Be as honest as you can about the highs and the lows, because the distortion in our identity usually is rooted in some sort of failure or pain from the past. Digging into that is often the key to unlocking, or at least finding, what our most true identity is. hear what the other instruments are doing. That’s helpful because you can’t just tune out every other voice. We all have parents — some great, some not. There will always be things you hear your dad or mom saying. We’ve all got friends — some healthy, some toxic. We’ve got pastors in our lives. Bosses. The key is to figure out what volume those voices should be allowed to have. Finding the right, best identity means turning up the voice of God louder than these other voices. If God really did create us, then He should have the loudest voice when it comes to our identity, who we really believe we are. Let what He says about us be what’s most true (even though those other things are also true). What are the biggest hang-ups you see from peoplein the church who want to lead but aren’t in a position of authority? Some people feel like they’ve got to get out on their own. They think, If I get passed over one more time, or if they don’t listen to me, or if they don’t take my opinion into consideration, then I’m leaving. In the book, I call this “unbridled” or “unchecked” ambition — the feeling that there can’t be anything in front of you, or anyone over you, in order to lead. That’s a distortion of what leadership really is. And then, on the other end of the spectrum, are the people who feel very passive. Handcuffed, unable to exercise any form of influence, because they’re not in charge. All of us fall somewhere on that spectrum. The key is to find the middle ground. What way is most glorifying to God and true to the gifts He’s given us? We’ve got to find that sweet spot where we’re not unbridled with our ambition, but we haven’t killed our ambition either. You write in your book, “Leaders don’t sit back and point fingers.” But what do you do when you see real problems that can only be fixed by the church’s senior leader, and he won’t do what you believe is needed? This is such a fantastic and important question, because if you and I don’t figure this out, we’re never going to enjoy a job. If I’m waiting on my bosses to do exactly what I think they should do before I feel like I can have the kind of influence I want to have, I’ll be waiting a long time. It’s a recipe for disappointment. But, what if the boss is sanctioning incompetence? What do we do about that? If there’s something that objectively needs to change, people have to figure out how to lead their boss. How do you bring it up in a way that’s not nagging or tearing something down, but opportunistic and positive in its sentiment instead — and also brings to the table value and a solution. That’s the key to learning how to lead when you’re not in charge. How do I become the kind of person who, when I bring something up, my boss wants to hear it? Too often, people short-circuit the plan by leaving too early. They don’t learn what they need to learn; they just blame. Part of the hope of this book is that people would quit using other people as an excuse for not leading well. As if God is waiting on any one of us to have a great leader before He can do anything through us. The Bible is littered with stories of people who work for corrupt, dysfunctional, unhealthy bosses. And yet, God was still able to accomplish His purpose through them, even under bad leadership. You’re in a position where you have quite a bit of responsibility and authority, but you’re not the top leader in your organization. What are some of the most important leadership roles for someone in that kind of position? Well, I give four behaviors in the book. I’m working on these, myself. The first is, you have to be leading yourself well. Second, you need to be a person who’s choosing the posture of positivity, despite how bad you think an idea (or the boss) might be. Every one of us works for someone who wants us excited about what we’re working on. That’s a choice. It’s a choice of attitude. Even if that’s shut down and they say, “No, it doesn’t work that way,” we have to convince ourselves that we haven’t wasted any effort or time — that we’re still getting better, and God is still working on something in us that will be leveraged later. What’s the most important lesson an emerging leader needs to learn when he or she isn’t in charge? Make sure you’ve convinced yourself that you can have influence from whatever position you’re in. So much of leadership is believing that you actually have a voice and can make a difference. Location of original campus: Alpharetta, Ga.
Now, if you’re two weeks into the job — or if you’ve failed at the last three things you’ve worked on — you need to take that into consideration. Maybe before you start leading up, or speaking out, or leading to your left and to your right, you have to create an oasis of excellence with what you’re working on right now. What about the person who isn’t in charge of anything, yet? Can attending conferences help future leaders develop skills? However small it might seem, you have to start somewhere. You have to say, “What’s the oasis of excellence I’m going to try to create today?” If that means cleaning out the prop closet, then start there. If it means being the best volunteer you can be, then start there. And do it while maintaining a posture of learning and curiosity. Have you seen other leaders apply principles from your book? What have you learned from them? In the chapter on rejecting passivity, I talk a lot about the temptation to skip preparation for an upcoming meeting if you’re not in charge of it. We go, and we sit there passively, and we think, I’ll weigh in, but it’s not my responsibility. Instead, it’s in our best interest to think: What’s the meeting about? How can I put some thought into what we’re trying to solve, or the idea we’re trying to create? Can I put my idea in the oven for a little bit? Even if we bring a half-baked idea to the meeting, it usually wins the idea, because none of the other ideas have been in the oven. Recently, while walking to my car just before [the] Catalyst [Conference] — where I hosted a three-day track — a young guy on staff came up to me and referenced that part of the book. A few months before, he was invited to the brainstorming meeting about the opening video for the conference. He ‘put his idea in the oven for a little bit’ and brought it to the meeting. I’m going to invite that person to the next meeting. I’m going to call that person the next time I’ve got a problem we’re trying to solve. That person has just gained influence with me.